Nigeriaâ€™s leading political parties, the All Progressives Congress (APC) and the Peoples Democratic Party (PDP), were on war path yesterday as both tore apart the policies and programmes of one another. 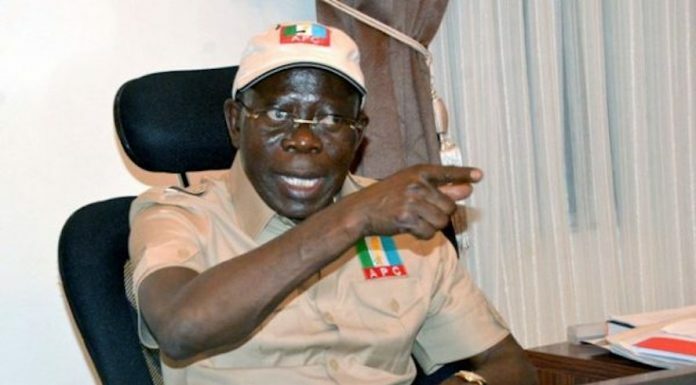 While the APC National Chairman, Mr. Adams Oshiomhole, said the PDPâ€™s presidential candidate, Alhaji Atiku Abubakarâ€™s, promise of 2.5 million jobs per annum contained in his policy document, presented yesterday, was deceitful; the opposition party replied that President Muhammadu Buhariâ€™s Next Level campaign slogan was dead on arrival. Speaking in Abuja after the APC National Working Committee (NWC) meeting, Oshiomhole said Atikuâ€™s annual job pledge was an empty promise and urged Nigerians to demand from the PDP presidential candidate and his party what they did with the promises earlier contained in the National Economic Empowerment and Development Strategy (NEEDS) document when they were in office. â€œIf you are going to create 10 million of jobs, how come that when you were in government before and you produced a (NEEDS) document, where you promised to create seven million jobs, by the time when the government was out, we had lost Michelin; Dunlop closed down; entire textiles industries closed down; we witnessed unprecedented industrial obituary,â€ he said. But the PDP responded in a statement by its National Publicity Secretary, Mr. Kola Ologbondiyan, that it was the APCâ€™s Buhariâ€™s campaign slogan and programmes that had arrived dead on arrival, claiming that the negative reactions of Nigerians to them backed his partyâ€™s position. Atiku had said earlier yesterday that he represented the hope and aspirations of Nigerians ahead of the 2019 general elections, explaining that his policy document was put together in 18 months by a team of experts he worked with on how to get Nigeria working again. The former vice president disclosed this on his Facebook page, while presenting his policy document titled, â€˜The Atiku Plan,â€™ where he said the sad fact today is that many Nigerians are not working and are living in poverty and insecurity. He noted that too often, Nigerians have been promised better governance by those seeking their votes, but stressed that such individuals have preyed on the legitimate desires of the people for their conditions to be improved, that they make all sorts of promises. Atiku lamented that the very fabric of the society is breaking down, adding that Nigeria has never been so divided as a nation. He stated, â€œOn October 6, 2018, I sought and obtained the mandate of the Peoples Democratic Party, to fly their flag as a candidate for the office of president of the Federal Republic of Nigeria. Today, I am formally presenting myself to you as the presidential candidate of not just the PDP, but of the hopes and aspirations of all Nigerians. â€œHowever, I am not here to tell you how I will get Nigeria working again. Instead I would like to tell you how we will get Nigeria working again together. â€œI am strongly of the view that I am just one Nigerian and one Nigerian cannot be as wise as all Nigerians. That is why I will offer an inclusive leadership. Atiku Abubakar is 100 per cent for 100 per cent of Nigerians, 100 per cent of the time. â€œOver the last 18 months, I have worked with the best experts Nigeria has to offer to come up with policies and plans that when implemented will get Nigeria going in the right direction again. The former vice president said he desires to run for the office of the president not because he has a bag full of promises, but because he is prepared to lead. Atiku explained that when he was the vice president from 1999 to 2007, he chaired the National Economic Council that gave Nigeria her highest and most consistent GDP growth of over six percent per annum. He said despite the fact that crude oil prices at that time were much lower than they are today, under President Olusegun Obasanjo administration, Nigeria paid off her entire foreign debt. He stressed that the administration equally introduced the GSM revolution that saw Nigeria go from 100,000 phone lines to over 100 million today. Atiku noted, â€œWe were able to achieve these, and much more, because we had a plan called the National Economic Empowerment and Development Strategy. 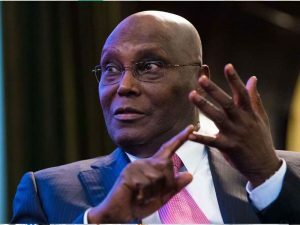 Atiku also said that his plan to restructure Nigeria would lead to a vast increase in the internally generated revenue, both for the federal government and the states via the matching grants that his administration would provide to state governments that increase their own revenue. These investments, he stressed, would create a minimum of 2.5 million jobs annually and lift at least 50 million people from poverty in the first two years. Meanwhile, the main opposition party has said negative reactions of Nigerians to the â€˜Next Levelâ€™ mantra of Buhari have shown that the document was dead on arrival. In the meantime, it said the resounding public endorsements that heralded Atikuâ€™s policy document were a confirmation that the document embodies the collective mindset, yearnings and aspirations of Nigerians. The party said the policy document was a product of painstaking and productive consultations with Nigerians, critical stakeholders and development partners in key sectors, in the overall determination to chart a new course for the country. It stressed that Atikuâ€™s policy document offers solutions and practical direction for delivery in all sectors of our national life. It noted that in line with its people-based manifesto, the Atikuâ€™s policy document places utmost priority on the people by focusing on their yearnings for job creation, infrastructural development, poverty eradication, human capital development, inclusiveness and national unity. The party added, â€œNigerians are particularly happy with the Atiku Abubakar policy document as it seeks to implement pro-poor policies that grant all citizens, irrespective of financial and social status, unhindered opportunity to participate in economic activities to achieve self-reliance and become active contributors to national development. The PDP, therefore, urged Nigerians to continue to take ownership of Atikuâ€™s presidential campaign, which it said embodies their collective aspiration as a people to make the nation work again. Meanwhile, Oshiomhole yesterday mocked Senate President Bukola Saraki over PDPâ€™s loss at the Kwara legislative by-election, saying the victory of the APC had rubbished the Senate presidentâ€™s political dynasty. He spoke after the partyâ€™s NWC meeting, which frowned at the actions of some party members who it said had resorted to litigation as a way of addressing their perceived grievances. The party said it that it had resolved to set up 10 reconciliation committees to visit states where there were outstanding disputes with a view to reconciling aggrieved aspirants. It warned that it would henceforth activate constitutional provisions to penalise such members as their action was capable of undermining the party and hurt the Partyâ€™s interest. 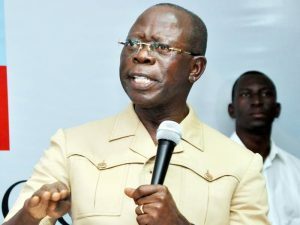 Addressing journalists after the NWC meeting, Oshiomhole said the leadership used the opportunity to celebrate and savour the hat-trick victories in by-elections in Kwara, Katsina and Bauchi States. He said the NWC meeting also resolved to set up 10 committees to embark on peace mission to the state chapters ahead of the commencement of campaigns. Oshiomhole particularly expressed satisfaction with the defeat of the candidate of the PDP in the House of Representatives bye election in Kwara State describing it as a major blow to Saraki. He said, â€œFor me, even more outstanding is the humiliating defeat Saraki suffered in the hands of Kwara people, who are determined to dismantle the Saraki failed attempt to install his own variance of a political culture of which he is the only constant decimal. â€œIn his own case what the people of Kwara have done to him is that they are going to politically bury him come February next year and he has seen the first warning. â€œI am sure Saraki would be politically retired by the good people of Kwara that he has mismanaged their economic and political rights over the years,â€ he said. Also in a statement yesterday by the National Publicity Secretary of APC, Mallam Lanre Isa-Onilu, the party said the actions of the aggrieved party men, who went to court, might be viewed as indiscipline and a violation of the APCâ€™s constitution. He said, â€œThis growing trend is viewed by the party as a manifest indiscipline. The actions, it should be noted, is considered as anti-party as it goes against our partyâ€™s constitution. APC advised such aggrieved members to withdraw all court cases, while approaching the appropriate party organs with a view to resolving any outstanding disputes. In addition to this, aggrieved members are urged to take full advantage of the reconciliation committees the party has just put in place.